Trump’s longtime adviser Roger Stone, who was a member of Trump’s campaign until August 2015, could face years in prison after he was arrested by Mueller’s team on Jan. 25. The 66-year-old Stone was charged with five counts of making false statements to Congress, one count of witness tampering and one count of obstruction of justice. Stone was accused of continuing to work behind the scenes in Trump’s campaign to get information from WikiLeaks, the organization that released hacked emails from the Democratic National Committee server during the 2016 campaign that were publicly damaging to Hillary Clinton and the DNC. The indictment says Stone falsely told Congress that he had no communication with anyone about the possession of hacked documents. “In truth and in fact, Stone had sent and received numerous emails and text messages during the 2016 campaign in which he discussed … possession of hacked emails …” the indictment reads. Intelligence officials say they have “high confidence” that the Russian government was behind the hacking of emails and other documents from the Democratic National Committee that were made public by WikiLeaks. “[C]ontained within his 24-page indictment are the evidentiary building blocks of a conspiracy that includes participation by ‘senior Trump Campaign officials,’ even as the Mueller probe appears to approach its final act,” wrote Glenn Kirschner, a former assistant U.S. attorney for the District of Columbia and a legal analyst for MSNBC, in an op-ed. 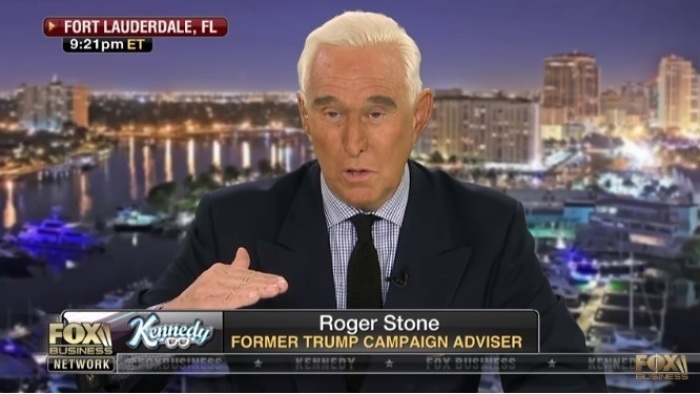 Stone, who was released on bond, said in an interview with Fox Business in an interview Thursday that he won't "implicate" the president and believes that the whole thing is "politically motivated." He assured that he hasn't discussed a pardon with the president. "I won't make up stories about him to try to ease the pressure on myself," he declared, adding that there are "absolutely, positively" not any true stories that he has that would implicate the president. "I do think that this is politically motivated. I do think that Mr. Mueller is seeking for some Russian-connected allegation so that he could remove both the president and the vice president, which would, of course, elevate Nancy Pelosi and would create a vacancy in the vice presidency and Pelosi could then appoint somebody ... like maybe Hillary Clinton." Andrew McCarthy, a senior fellow at the National Review Institute and former assistant U.S. Attorney for the Southern District of New York, wrote in an op-ed that Mueller “doesn’t even pretend to prove” the portrayal of collusion that it paints in the indictment.